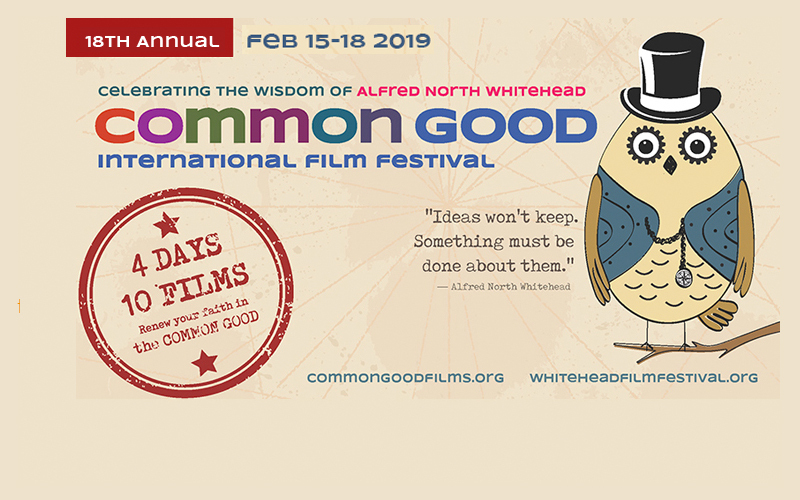 Four days of films and discussions that elicit common sense, common decency, and the common good, while celebrating the wisdom of Alfred North Whitehead. With ten films meant to inform, inspire, and amuse, the Common Good Film Festival celebrates the work of filmmakers that tell the stories of those dedicated to the benefit of humanity. Our 2019 Common Good International Film Festival is one month away, and we are pleased to announce the full schedule of feature films (listed below) and short films. We hope you will join us in watching these ten films. The films deal with a wide range of issues and events related to the Common Good, including human rights, family relations, refugees, love, creativity, mental illness, and our relation to the earth. Film passes, banquet and opening night tickets, and registration for the class are all available on our website commongoodfilms.org or by contacting the Center for Process Studies. If you love film and the common good, we encourage you to sign up for the class, called Film & the Common Good, which also makes you a member of the festival jury. In the class, we will talk about our criteria for judging the films; discuss what kind of efficacy film can have in promoting the common good; talk about faith, film and all of the topics that emerge through these features; and debrief and evaluate each feature film throughout the weekend. We are pleased that Bonnie Hawthorne, director of Dreaming of a Vetter World will join us as our banquet speaker to discuss her documentary about David Vetter, pioneer of organic farming in the US. David himself will also be present for the banquet and screening, and both Bonnie and David will be a part of the discussion following the film. David’s commitment to healthy, sustainable agriculture, and Bonnie’s careful and personal way of documenting it, provide an excellent start to our festival of films promoting the common good.